“Bryophyte Ecology” is the result of more than a decade of research, collaboration and composition by Professor Emerita Janice Glime (Bio Sci) and many contributors and photographers. The five-volume work is unique not only as the most recent comprehensive reference on bryophyte ecology, but because it is “open” to the world. “Bryophyte Ecology” was initially self-published on the web and is now accessible on Digital Commons @ Michigan Tech. Moving the work to Digital Commons ensures long-term preservation and easier access. Additionally, the work reaches top slots using any search engine. Glime’s goal in creating an open work “was to reach a broad audience in an affordable format with lots of illustrations and a readable style. “Bryophyte Ecology” has been used as a textbook, reference source and field guide. 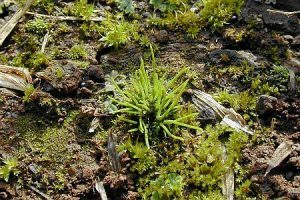 It contains many color photographs, information on physiological ecology, bryological interactions, methods of collection and various uses of bryophytes as well as question sections throughout to facilitate learning. Discover the world of bryophytes here. Digital Commons @ Michigan Tech, the university’s digital repository, is a platform for storing, sharing and showcasing research and educational resources. To learn more or to consider adding your own work contact digitalcommons@mtu.edu.